Marissa Mayer better not offer too many breadsticks at Yahoo's corporate cafeteria. Starboard Value, the same hedge fund that has been criticizing Olive Garden owner Darden Restaurants (DRI) for its food, released a letter to Mayer and Yahoo's board saying that it had acquired a significant stake in Yahoo and wants the company to do a strategic deal with rival AOL (AOL). Shares of Yahoo (YHOO) shot up more than 4% Friday after the letter's release. AOL's stock rose more than 3.5% on the news as well. Mayer said in a press release that Yahoo will review Starboard's letter and that it "looks forward" to discussing it with the hedge fund. She added that Yahoo has "great confidence in the strength" of its business and that the company will give an update about how it plans to use some of its capital during a conference call following its third quarter earnings report in October. Starboard was also not available to comment about exactly how big of a stake it owns in Yahoo. It has not yet made a filing with the Securities and Exchange Commission to disclose its position. Speculation about a Yahoo-AOL merger has been around for years -- pretty much since AOL was spun off from CNNMoney parent company Time Warner (TWX) in 2009. The chatter picked up steam once Mayer joined Yahoo from Google since AOL CEO Tim Armstrong is also a Google veteran. The rumors surfaced again last week as Yahoo prepared to cash in on part of its stake in Chinese e-commerce company Alibaba. Yahoo is estimated to have raised more than $5 billion after taxes from selling some of its Alibaba (BABA) stock. AOL is worth about $3.5 billion. Shares of Yahoo have underperformed compared to other big techs this year. The stock is flat despite a decent rally in anticipation of the Alibaba IPO. Starboard said in its letter that it feels Yahoo's core business is "deeply undervalued" and that the company would be better off selling the rest of its Alibaba stake as well as an investment in Yahoo Japan in a tax-efficient manner. As for an AOL deal, Starboard estimates there could be $1 billion in cost savings through a combination of the two companies. Starboard already has a contentious history with AOL. The hedge fund pushed AOL to make strategic changes back in 2012 and even tried to nominate its own candidates to AOL's board. 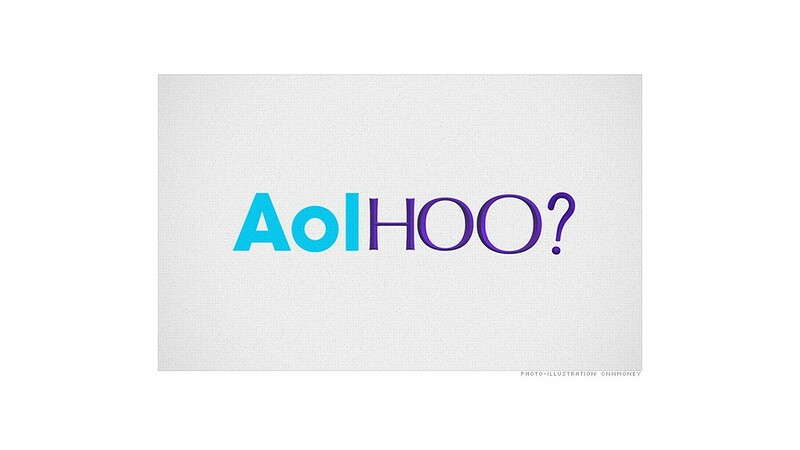 That effort failed and Starboard wound up selling its stake in AOL as a result. Starboard added that it felt Yahoo and AOL together could "more successfully navigate the ongoing industry changes" and increase revenue. Those industry changes include a dramatic shift to mobile for online content and an increased emphasis on video and social media. Both AOL and Yahoo have had a tough time competing against Google (GOOGL), Facebook (FB) and Twitter (TWTR) in the battle for online ad dollars over the past few years. Still, even though a deal between Yahoo and AOL might make sense since both companies have been building up their news operations lately, many analysts say that merging them would do little to make them more of a threat to Google and Facebook. And while Mayer has made numerous acquisitions of startups since she joined Yahoo in 2012, most notably of blogging site Tumblr, an AOL purchase would be a very ambitious deal. Starboard said that many of the purchases made on Mayer's watch have "failed to deliver material revenue growth." The hedge fund also said Yahoo would be better off "halting the current aggressive acquisition spree." Although it does seem odd that Starboard's answer to ending Mayer's M&A binge is for her to do an even bigger deal.